With the help of exaggerated films and the misconceptions on social media, most people believe that sharks are monsters, obsessed with eating human flesh. If this was the case, there would be a high number of shark attacks each day around the world but the truth is, not all sharks will attack. While sharks are considered the predators of the sea, they don’t eat humans. They attack because humans flapping in the ocean looks a lot like their natural prey. Which is mostly marine mammals, smaller fish and sea turtles. 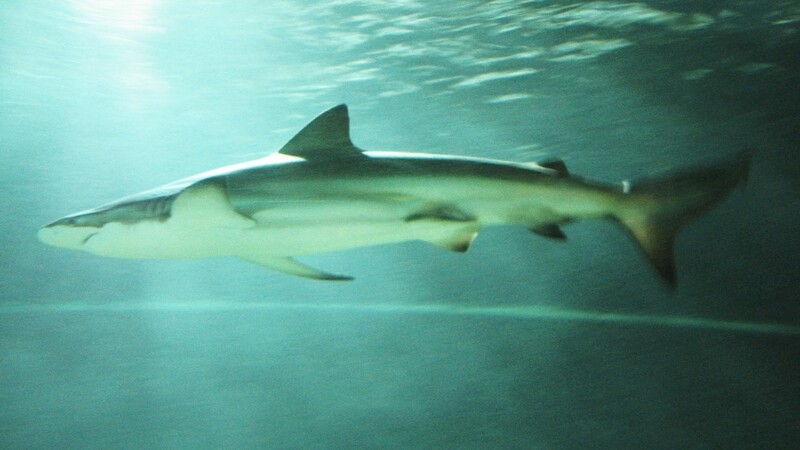 Sharks often releases a person after the first bite. However, this doesn’t mean that you can freely swim in shark infested waters and expect to walk away. Not much is known about sharks. Scientists have yet to learn more about their mating practice or even what happens to them once they have died. Sharks have been on this earth a lot longer than humans and are vastly intelligent creatures. Sadly, they are under threat as their numbers are fast declining due to over-fishing and a high demand for shark fin on the black market. Conservation and volunteer programmes have increased recently, in hopes of highlighting the importance of understanding and respecting these majestic marine life. 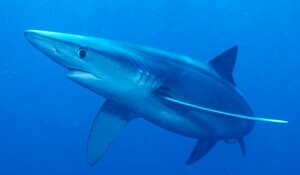 The Blue Shark is one of the most common sharks. It can be found as far north as Norway and as far south as Chile. However, it rarely comes in contact with people. In terms of danger the odds a firmly stacked in the human’s favour due to over-fishing. On the other hand the blue shark is considered potentially dangerous and has been responsible for fatal attacks. 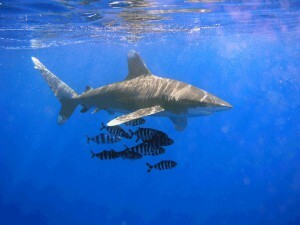 The Bronze whaler or copper shark is known for its colour and for congregating with other sharks at sites of whale kills during the days of whaling. They are commonly found in shallow bays and harbours. The bronze whaler is a large shark reaching over three meters in length and weighing around 300kg. It is a fast powerful swimmer equipped with long serrated teeth. While they aren’t known for generally being aggressive but there have been reports of unprovoked, fatal attacks on swimmers and surfers on the east coast of Australia. This species of shark has been called a “man eater” as it’s killed more people than all other shark species put together. However, the majority of these attacks were opportunistic and a result of a sea disaster. It is believed that sharks were responsible for the deaths of hundreds of sailors after their ships sunk during World War II. The prime attacker being the whitetip. 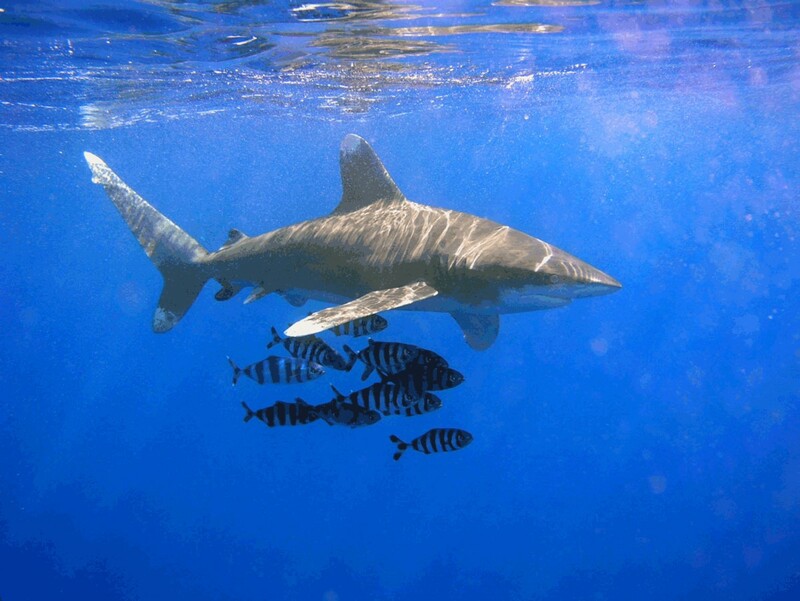 While they are slow moving and lethargic the oceanic whitetip can be incredibly aggressive and persistent. They are known to engage in feeding frenzy behaviour with an attitude to take whatever is available rather than avoid a fight and wait for the next opportunity. The bull shark is a large powerful shark, measuring up to 3.5 meters in length and up to 318 kg in weight. It gets its name from its flat snout and stocky build. They have several rows of triangular, serrated teeth ideal for slicing through prey. 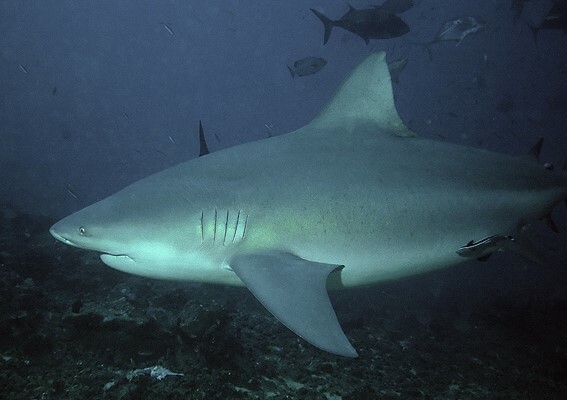 Bull Sharks are highly territorial and are known to attack other species that threatens its territory and that includes humans. This shark is extremely versatile in that it lives in shallow coastal waters but can also tolerate fresh water. ISAF has ranked the Bull Shark third due to the number of attacks. However, ISAF reports that most of the attacks go unreported as it happens in third world countries. There have been 104 recorded attacks of which a third were fatal. The Great White, notorious for the Jaws movie, has established a reputation as a “man eater”. The biggest great white specimens are around 6.5 metres in length. However, several reports of sharks as big as 8 metres and weighing nearly 3.5 tons have been published. Their triangular teeth, around 3 inches long which are serrated along either side, are used to slice up the prey which the shark does by shaking its head from side to side. 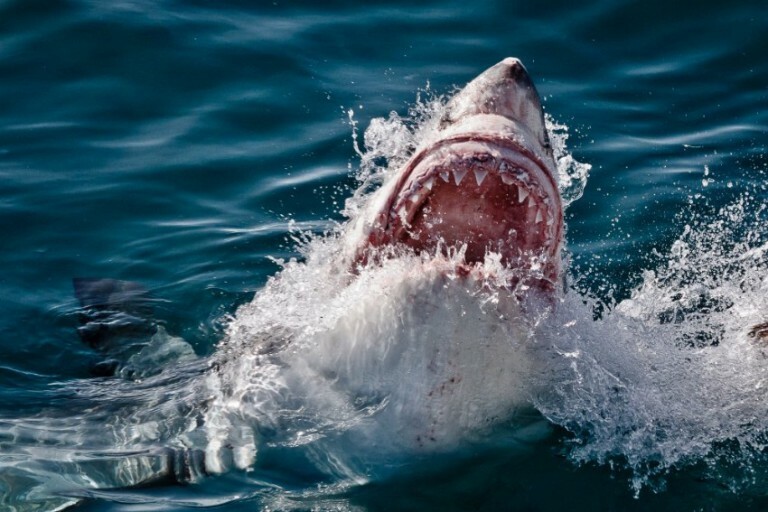 Great whites actually have no interest in eating humans, nowhere near enough flesh, and it seems most attacks are mistaken identity or the shark just being inquisitive. 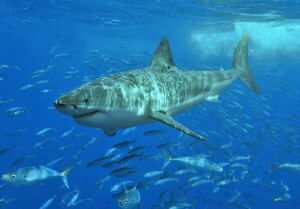 The great white is the most dangerous of all sharks with over 400 attacks recorded worldwide of which many were fatal. Gansbaai is known for being home to high numbers of Great Whites. If you want to get up close and personal with these wonderful creatures, consider one of shark cage diving package tours for an experience you’ll never forget.